Caroline Lavinia Scott was born on October 1, 1832, in the quiet college town of Oxford, Ohio, to Mary Neal Scott and John Witherspoon Scott. While she was First Lady, Caroline told a reporter at the White House that she remembered a happy childhood at Oxford, Ohio, enjoying a close relationship with her parents and siblings: an older sister Elizabeth, a younger sister Mary and two younger brothers John and Henry. Caroline’s talents in art and music were nurtured from childhood. Her Aunt Caroline Neal often visited the Scott family in Oxford and gave her niece Caroline many hours of instruction and guidance in drawing. Caroline received her degree in music, art, and literature from the Oxford Female Institute in 1852. It was during her school years that she met the young Benjamin Harrison. In August 1852, even though Benjamin was not earning an income, he and Caroline decided to marry. On October 20, 1853, they were married in the parlor of the Scott home. They moved to Indianapolis in 1854 and over time had three children: a son Russell, a daughter Mary, and an infant daughter who died in 1861. A leader in Impromptu, a local literary club, Caroline became well-known for her portrayal of Dickens scenes. She took pride in her charity work as a board member for the local orphanage. Caroline found time for her own passions and took lessons from the gifted artist Paul Putzki. Her art work was entered and rewarded in the Indiana Exposition. Her favorite flower was the chrysanthemum, but she is known for her love of orchids and grew them in the White House conservatory. Many of her watercolor and china paintings are of flowers. 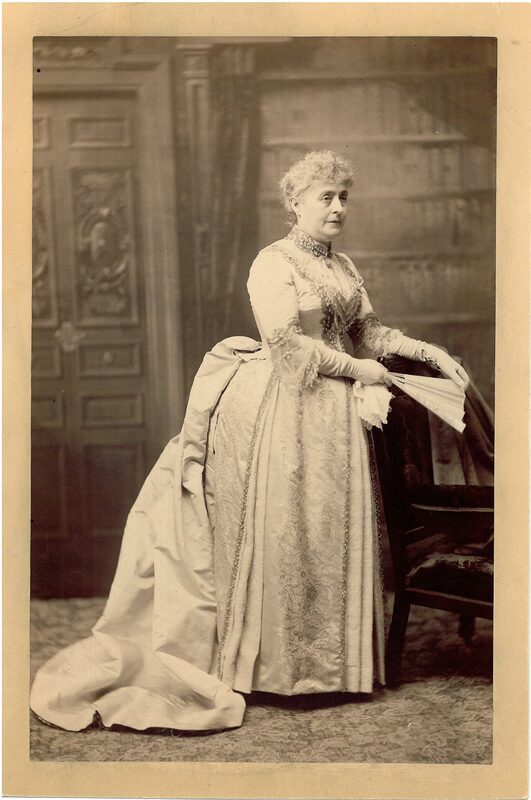 Supporting her husband’s platform of protection for American industry, the design of her inaugural, fabric and gown were “made in America.” The oak leaf pattern, designed by Mary Williamson of Lafayette, Indiana, was manufactured into the fabric by Logan Silk Mills in Auburn, New York. As First Lady, Caroline was very concerned with the living quarters at the White House. She found conditions less than desirable. 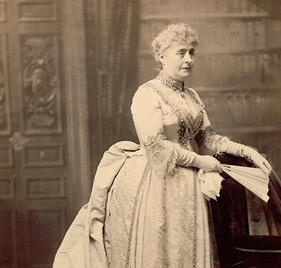 Caroline was the first First Lady to manage her own project and even held a press briefing. She lobbied Congress to completely remodel and expand the White House. The bill did not pass, but they gave her money to clean the house and make minor improvements. 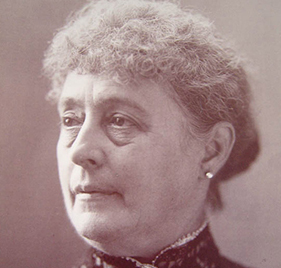 In 1891, May Wright Sewall was honored when Caroline appeared at the closing session of the National Council of Women’s triennial meeting in Washington. Caroline also sent a large basket of roses to Sewall in congratulations on her election as president of the council. In 1890, the newly formed National Society Daughters of the American Revolution (NSDAR) asked her to become their first President General. 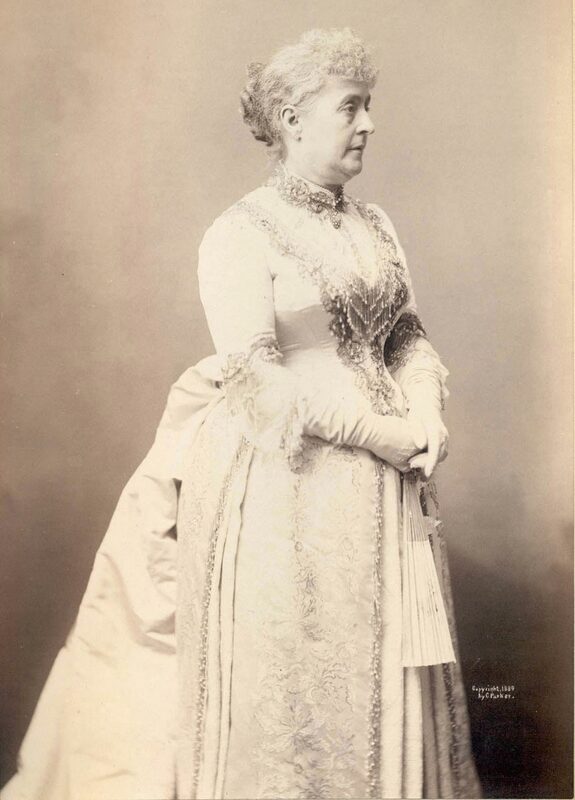 On the evening of February 24, 1892, Caroline gave an elegant White House reception and dinner for the regents and delegates at the first Continental Congress of NSDAR. The new Harrison White House china service was used for the first time that evening. Caroline gave the first speech ever by a sitting First Lady at this occasion. 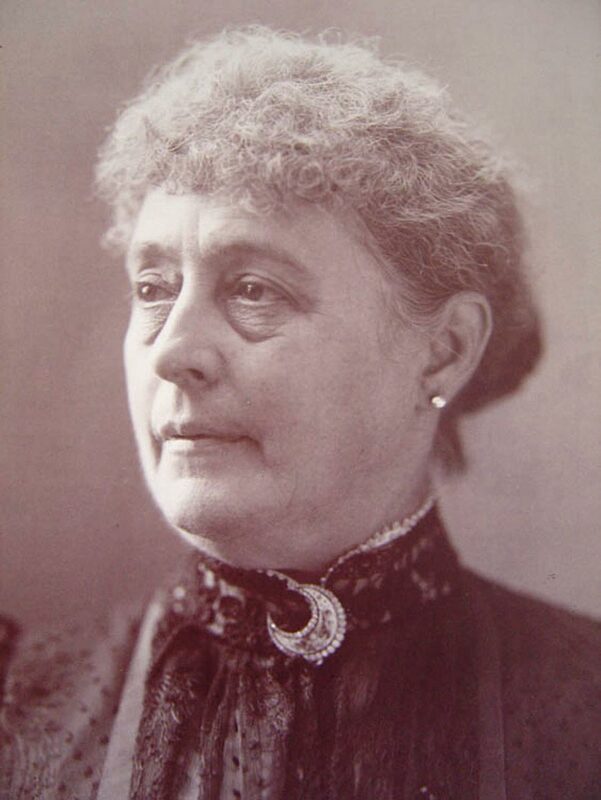 A local Indianapolis chapter named after her was organized in 1894. In the winter of 1891, while she tried to fulfill her social obligations, Caroline was frequently ill with bouts of bronchial infections. She was diagnosed with tuberculosis. In July, she was taken to Loon Lake in the Adirondack Mountains for treatment. 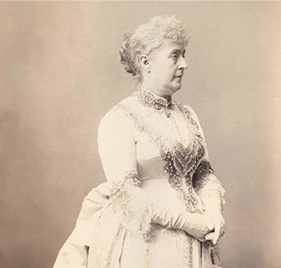 On September 20, she was brought back to the White House, where she died on October 25, 1892. Following funeral services at the White House and at the First Presbyterian Church in Indianapolis, she was buried at Crown Hill Cemetery in Indianapolis. Interested in learning more about Caroline’s legacy? Check out these sites.